Veteran trees are amongst the countryside’s most valuable treasures. They have an unrivalled aura of grace, romance and history. Sir David Attenborough stated, “Ancient trees are precious. There is little else on earth that plays host to such a community of wildlife within a single living organism.” Wight Conservation is proud of its veteran trees which exist in the two former wood pastures, Wroxall Copse and Rowborough. They number some 150, consisting principally of pollarded ash, field maple and crab apple. They have a priority in our woodland plans, even though their management can be expensive and on occasions, such as when reducing the height of the crown, dangerous. In December 2003, Ted Green MBE, President of the Ancient Tree Forum, and Jill Butler, Conservation Policy Officer for the Woodland Trust, visited our two old wood pastures and gave us a comprehensive management report. The report emphasises the high conservation value of both woods, Wroxall Copse in particular. 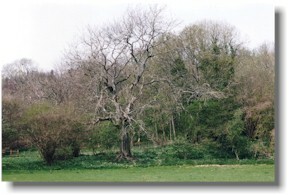 Wroxall Copse is believed to be in the top 50-100 sites in the country, and Rowborough in the top 350. It is important for the general wildlife that the woods with veteran trees are left undisturbed as possible. Nevertheless, in order to share their beauty with more people, Wight Conservation will organise one walk to each site each year. Numbers, however, will be strictly limited and booking will be essential. For further details, please CLICK HERE.